Good Morning! Time for a Readathon. I'm trying to get the jump on the Readathon by starting early. I won't be able to do the whole 24 hours. Ugh, obligations. I don't want to miss out altogether though, so I'm doing what I can. 1) What fine part of the world are you reading from today? As always, my couch here in Nova Scotia, Canada. What I wouldn't give to be blogging from the Caribbean right now. 2) Which book in your stack are you most looking forward to? The Royal We! It looks like a lot of fun. 3) Which snack are you most looking forward to? I was looking forward to Lemon Squares, but I had a kitchen disaster worthy of a Gordon Ramsay show. I dumped most of the uncooked lemon filling into my hot oven. I still baked them but they weren't as lemony as they should be. I also spent last night cleaning my oven. Anyway, here's the recipe if you'd like to try it. 5) If you participated in the last read-a-thon, what’s one thing you’ll do different today? Maybe not drink alcohol during hour 13. It makes me sleeeeeepy! I'll be updated this post throughout the day. Happy Readathoning! *Readathon button by Bart's Books. 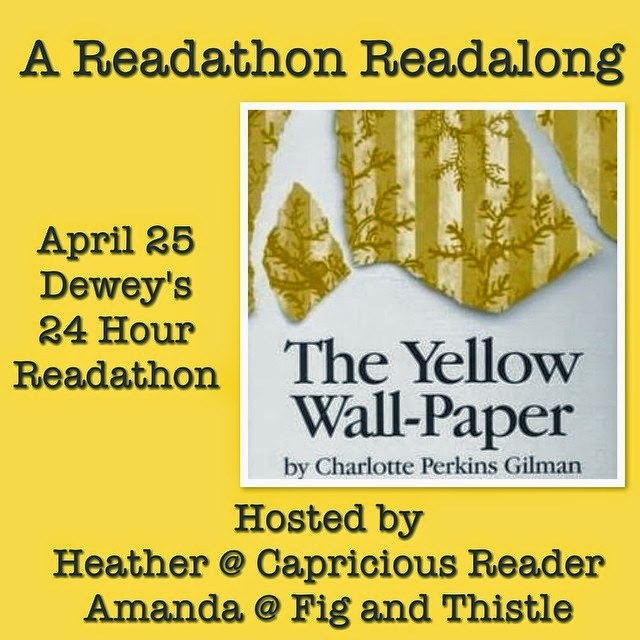 I started the day with The Royal We but I'm switching to The Yellow Wallpaper for the Readathon Readalong. I love this story. I'm trying to look at it from a different angle than the first time I read it. As for foods, I ate a bagel, and those infamous lemon squares. Happy Reading! Very glad to see you here today. And you may wish you were in the Caribbean now, but later this summer everyone in the Caribbean will wish they were in Nova Scotia! Hope you have a great readathon. I hope you rock the readathon! I'm going to have to read your post about Orphan Black. I've been so curious about it. Happy reading. It was my first time reading The Yellow Wallpaper. I really liked it! I have to reread it soon though, when I have more time to really think about it.